Believe it or not Nollywood beauty queen Genevieve Nnaji is gradually following the lifestlye of controversial material girl,Tonto Dikeh. 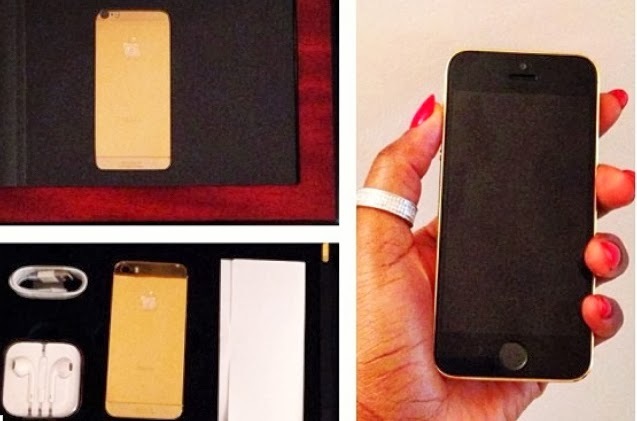 The mother of one took to her Instagram page two days ago to inform fans of her newly purchased golden iPhone 5s gadget. Though she didn’t specify the price of her customized 24 carat golden iPhone 5s, sources in the know claim the gadget costs $5,000. The elite iPhone embellished in 24carat gold was bought from a customization and wealth creation company in the United Kingdom, GoldenGene Global. Genevieve Nnaji has joined top celebrities that include Kate Moss, Victoria and David Bekham, Thiery Henry and Elton John, who are clients to the GoldenGene Global. cable, USB adapter, documentation and a total body protection installed by master craftsmen that has styled and customized Victoria Bekham and Kate Moss’ phones. 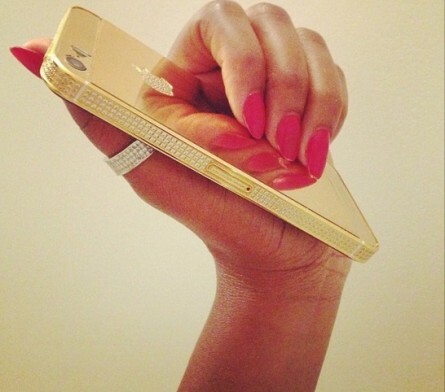 Genevieve Nnaji’s iPhone 5s is the latest model from September 2013. Genny is now a golden girl. Goldgenie is the company she purchased the iPhone 5s from. Hmmmm Genny the golden girl.